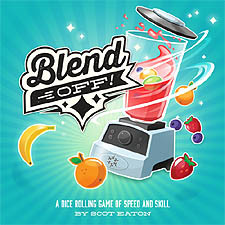 Blend Off! is a game of speed and skill! there are no turns; everyone plays at the same time in a race for the finish. Master Mixers roll their die to collect fruit to fill the orders from the deck. When their fruit matches an order, a Master Mixer blends it and claims the order for gold stars. The player with the most gold stars at the end of the game is the winner.